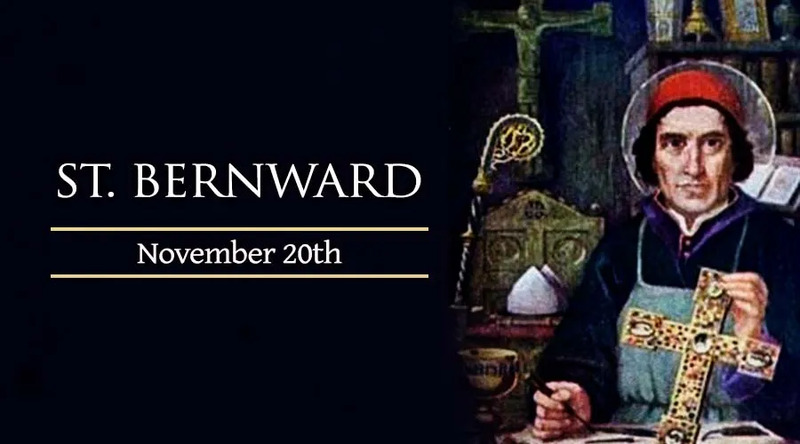 Saint Bernward served as the thirteenth Bishop of Hildesheim, Germany during the middle of the tenth century. His grandfather was Athelbero, Count Palatine of Saxony. After having lost his parents, Bernward was sent to live with his uncle Volkmar, who was the Bishop of Utrecht. His uncle enlisted the assistance of Thangmar, the pious and well-educated director of the cathedral school at Heidelberg, the help with Bernward's education. Under the instruction of Thangmar, Bernward made rapid progress in Christian piety as well as in the sciences. He became very proficient in mathematics, painting, architecture, and particularly in the manufacture of ecclesiastical vessels and ornaments made of silver and gold. A man of extraordinary piety, he was deeply devoted to prayer as well as the practice of mortification, and his knowledge and practice of the arts were employed generously in the service of the Church. Shortly before his death in 1022, he was vested in the Benedictine habit. He was canonized by Pope Celestine III in 1193.